Available only at The Container Store, our Cabinet-Sized Elfa Mesh Drawers are uniquely designed to provide compact storage in spaces that are too small for our regular-sized Elfa Drawers & Accessories. They fit Cabinet-Sized Medium Frames or an Elfa classic Hanging Drawer Frame. 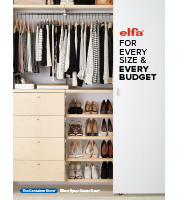 A Cabinet-Sized Elfa solution is perfect for maximizing storage space in bathroom and kitchen cabinets, small pantries or closets and armoires. White Cabinet-Sized Elfa Mesh Drawers is rated 4.8 out of 5 by 78. Rated 5 out of 5 by Neatandtidy from Grate for food organization I use this system to organize my food storage closet and works really great. Looks good, high quality and functional. Very very easy to install also. Rated 5 out of 5 by PackAttackMom from A Place for Everything... I have a tall pantry with deep shelves. After years of complaining because it was always disorganized, items in the back either expired or were forgotten about, and buying triple of some items.... I was determined to get organized. With multiple options of width and length combinations, I quickly found two baskets that sit side by side and stretch the entire length of the shelf. Baskets are sturdy, hold cans goods, but are light weight. We didn’t even need to install the runners, the baskets easily slide in and out. Rated 5 out of 5 by Marie18 from Great for storage We use this to collect our belongings near our front door. Looks stylish and works wonderfully so we don't misplace things. Rated 5 out of 5 by DianeL from Perfect for organizing things under bathroom sink We used a short basket on one side and a medium on the other side of the vanity cabinet - slides easily even full of cleaning products. Rated 5 out of 5 by Tomcandoit from From the hall closet to the pantry This store continues to exceed this houses expectations. The variety, quality and knowledgeable personnel are terrific. We completely modeled the entry hall closet and the kitchen pantry. The products are easy to install and very strong. Rated 4 out of 5 by Chantik from I like it I like these drawer set. I will buy one more time WHEN ITS ON SALE. Rated 5 out of 5 by valdogg from Good size Great size for sack holding in the pantry closet. Was decently priced. Rated 5 out of 5 by Mmwells65 from We struggled with finding a way to organize our son's Lego collection; the Elfa drawers were the perfect solution! They are very durable and hold a ton of Lego pieces. Rated 5 out of 5 by kstewy from Open, open, open! Love these drawers, as I have purchased many, attached them to the gliders and turned my shelves into easy-to-get-to wonders! My only wish: that these were available with ends that open!!! I would be happy to pay more for the versatility factor that a clip and close end would offer. For instance, I have the large mesh drawer above my washer. So, contents are a little difficult to grasp since I have to reach up and in. An open/close end would solve the problem. Rated 5 out of 5 by gwwhite from Excellent storage basket I bought these for my kitchen pantry and they keep everything in sight and are easy to clean! Good quality for a great price. Rated 5 out of 5 by J2theC from Light at the end of the Collapse My shelf collapsed one evening. Once I picked my clothes off the floor, on the advice of my girlfriend, I went to the Container Store website. I was blown away by the many design options and felt that I could utilize my carpentry skills. We went to the store and looked around. They design a closet to suit my needs AND installed it for well under my budget. So now I have twice the space and I must say I am glad my closet imploded. Rated 5 out of 5 by TwinCitiesGuy from Cabinet sized drawers perfect for home office Elfa products are simply the best. The cabinet size drawers are a perfect width and length for storing paper and other home office products, and the option to insert two-runner drawers provides for situations where more depth is needed. Rated 4 out of 5 by Featheringthenest from This is gonna be great! Just when I was sure that I had Elfa-ed everything that could possibly be, I discovered that I needed to put a set of drawers under my kitchen sink. So I placed my order for cabinet-size Elfa, had my husband pick it up and I began preparing the space. Now it's two weeks later and I'm ready to assemble and find that I didn't order the frame! So I have some lovely drawers, drawer stops, and feet which I'm sure will work wonderfully… one of these days! I'll let you know how this goes when there's a sale and I can buy the frame *Persevering face* But just look how neatly everything fits in those drawers! Rated 4 out of 5 by josie273 from Perfect for under bathroom sink we bought the two drawers and put them under the bathroom sink. It is perfect to put my blow dryer, curling irons etc in so they are not cluttering up the bathroom counter. Rated 5 out of 5 by WizeOrganizer from Great product I have purchased the Elfa drawers and over the door pantry holders for numerous organizing clients and have had complete satisfaction for everyone. I love the Elfa products! Rated 5 out of 5 by RobertL from Elfa Drawers Great looking, well built. I like using all the Elfa products, whether I buy a kit, or design and build myself. Rated 5 out of 5 by Lbmorrison from I love these! I've measured all of my cabinets and vanities for these drawers. Rated 5 out of 5 by mdohr from elfa mesh drawers Perfect for my needs. I use a 7 slide frame with a mixture of drawer types in my pottery studio and they are ideal for dry or damp storage. I have various elfa units in my small (but now efficient) work space. Rated 5 out of 5 by DanaEv from From chaos to control! Before I got my Elfa sliding basket, I used many small baskets. How annoying and time consuming. Now I roll out my Elfa basket, take what I want and move on, in seconds! Rated 5 out of 5 by OrganizedHill from My Pantry Never Looked Better! This product is great. My husband installed them easily and they glide beautifully. I bought two different depths to contain different items. I love how beautiful they look with the labels! I will definitely be adding them to other areas of my home. P.S. I still need to add one more runner to the bottom section! Rated 5 out of 5 by Lewey from Great product We are able to do away with furniture as we can get these drawer units in our closet. It really helps to declutter our rooms and organize our lives. Rated 5 out of 5 by betced from Great way to get organized The options and sizes of products can be combined to fit any space. Rated 5 out of 5 by MomHat from Great for Legos We bought these for our son to sort his Legos. They work great. Rated 5 out of 5 by Organizer02 from Best purchase This is the second elfa shelf system I have bought in the last few years. I love having this one in my pantry. Hope to buy more. Rated 5 out of 5 by KSots from funny how something simple can make a huge difference. Rated 5 out of 5 by star5400 from Excellent purchase Great product as to size, appearance, & durability. I have an old ELFA organizer which I have owned for almost 20 years. It is still in one piece & providing its very useful purpose in my kitchen! Rated 5 out of 5 by Brandi10 from Love the strong drawers We did a pantry renovation and I used the Elfa drawer system. It work beautifully!!! They are very strong and perfect for our pantry:)!! Yes, our Cabinet-Sized elfa Mesh Drawers and Frames are available in Platinum (shown below). How much weight can the drawers hold? and are the wire ones stronger than the mesh? I want to use this to hold baking supplies many of which are i glass bottles and the weight can add up. Purchased mesh for looks. We have gallon detergent stored in the alon with other weighty items. what does one runner /two runner mean? Where on your site can I find the rails that hold the ventilated brackets? Yes. It will. The drawers are metal and they could scratch wood easily. How many inches deep are these drawers when extended? When fully extended, these drawers will be 30&quot; from the back of the frame to the front edge of the drawer.